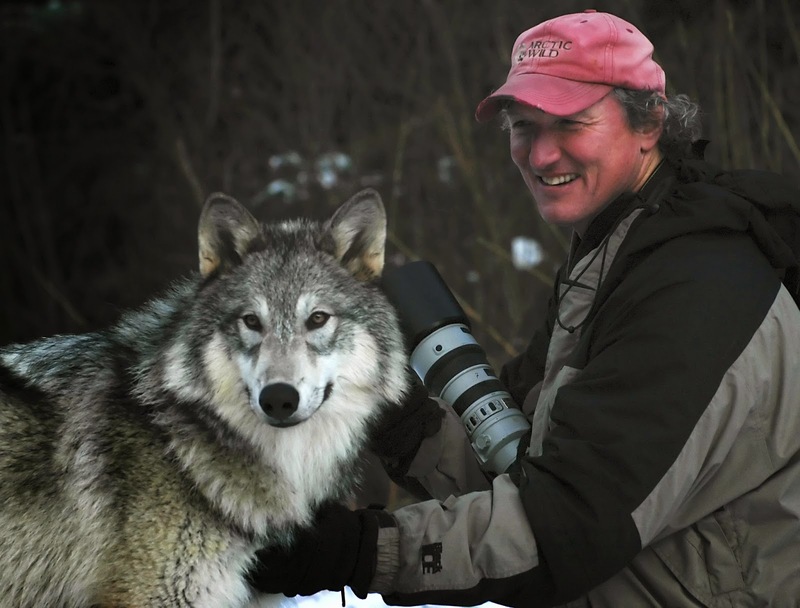 That's me, Nick Jans, with Isis, a captive born but very wild in her heart purebred Alaska wolf, three years old. I've known her since she was four weeks. She lives at the Kroschel Wildlife Park north of Haines, a few miles from my place. No mistake about it, a wolf, even tame to the max as she is, is far more than a big, ultra-smart, ultra-strong dog. It's a wild thing that thinks for itself, no matter what you do. So it's not a dog most folks would expect to see here. But you did say coffee with a canine--and a wolf, canis lupus, surely is that. I've had coffee before and after walking or playing with Isis, but you can't just carry a bunch of loose items, like my favorite steel spillproof cup, around a wolf, captive or not. They want to investigate everything with their mouths, which have an uber-canid bite pressure to match their will and intelligence. Hard to keep my camera gear away from her with both hands. And she gets snippy once she thinks she owns something and you try to take it back. Not good with a wolf. So, I'm a full-time Alaska nature writer, photographer, and wildlife advocate; lived here 35 years, 20 in ultra-wild country in the upper left-hand corner of the state. I'm a contributing editor to Alaska Magazine and a member of USA Today's Board of Editorial Contributors. First thing I ever published for pay was a short poem in Rolling Stone, in 1986, I think. They paid 20 bucks. Paul McCartney was on the cover, and I still know that poem by heart. I've published 11 books, ranging from collections of personal essays to a kids' photo book to texts for others' photo books to full-length nonfiction. A Wolf Called Romeo, out with Houghton Mifflin July 1, is the most recent. It may be the reason I was born, to witness this story and tell it as best I could. It was one of those transformative experiences you don't get over. Well, it's the publication of A Wolf Called Romeo. 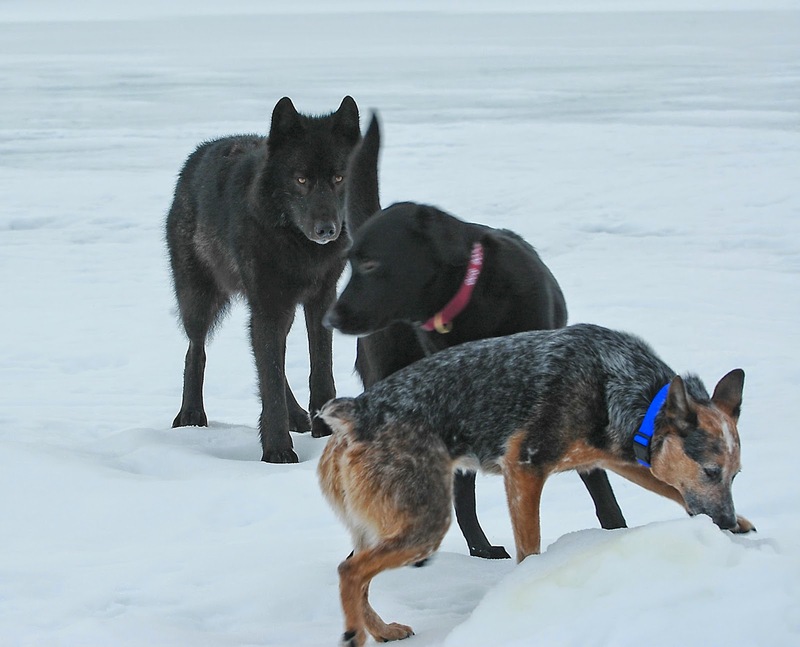 The quick version of the book goes like this: a 120-pound, totally wild black wolf shows up one day on the edge of wilderness and Alaska semi-suburbia, and wants to play with our dogs And everyone else's. He's oddly tolerant of humans, gentle with our pooches, and still a wild wolf who hunts for his own food and comes and goes as he pleases. He even seems to bond, to a surprising extent, with a few humans. This went on for six years, his life hanging by a thread the whole time, and this is the story of the wolf the people of Juneau, Alaska, came to call Romeo. This book explores, among other things, the boundaries between us and the wild. That includes thoughtful comparison between wolves and the domestic, genetically engineered canines we call man's best friend, all of whom carry 99.98 percent of a wild wolf's genetic package. But that .02 percent difference looms huge. I like my coffee strong, with big flavor and not anything in it besides coffee. On the side of my coffee machine's carafe, it says eight cups, but I knock it down in two big mugfuls, in the same steel spillproof cup I've had for over a decade. Sometimes another big cup follows in the afternoon. Coffee and writing are pretty much fused into my daily life. I don't do one without the other. And naturally, since I work at home all our dogs hang with me while I write, and keep me company. 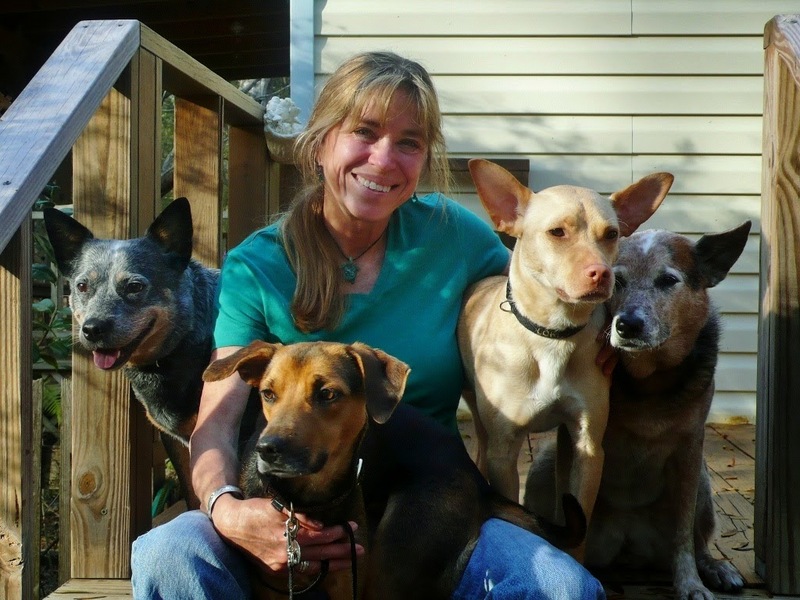 Currently, we have four--two blue heelers, Chase and Brisa, and two mixed breeds, both rescues from north central Florida, where my wife and I (and critters) spend the winter these days. Loki, a straw-colored, big-eared, short-haired terrier mix, was raised in a Tampa area crack house as pit bull bait, and eventually tied to a tree and left for dead in a homeless camp. Sal, our little black and tan hound thing, we found starving by the side of a country road a few miles from our Florida winter home. They're all great dogs--very smart, physically talented, and well-trained. Chase, age 13 and nearly blind and deaf now, holds an AKC Master Agility Championship, called a MACH. 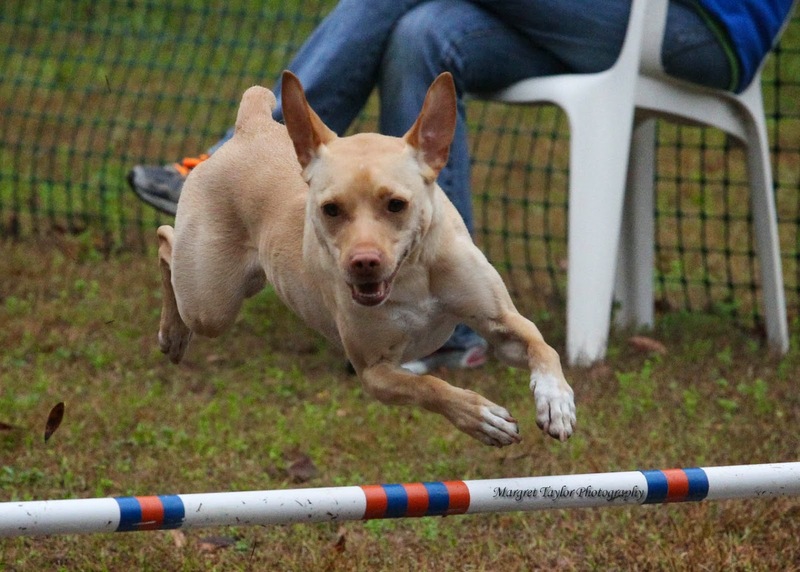 Loki [photo right] just qualified for the 2014 CPE National Championships in dog agility competition. Sal is an up-and-coming beginner in the sport. Brisa, arguably the most talented of the bunch, told us she doesn't want to compete, so she just watches and keeps the others in line. Down in Florida, they all take morning walks with me around our five wooded acres while I drink my first cup of the day and slip them slivers of granola bar. It's a ritual. Since I'm a professional photographer, I seem to end up on the other side of the camera most of the time. They love me, I have no doubt, but they're always on the wait for what I might divvy their way--those bits of granola bar, bites of apple or carrot, dried Alaska salmon treats. Robert Frost put it this way: "better to go down dignified, with boughten friendship at your side, than none at all. Provide, provide!" Treats for me amount to making a horse's arse of myself on such celebratory occasions. Can't say exactly, other than we always give each name long thought and mull over the possibles before deciding, just like naming your kids. All dog owners have aliases for their pooches, don't they? Chase also goes by Ticey (a derivative of her name) or Old Lady. Brisa (which means 'breeze' in Spanish) most commonly goes by Poke Chop--that on account of her thick muscled thighs. Loki (the Norse god of mischief and fire) is also the Loke-a-Lope, and my wife Sherrie calls him Buddy, because they're such good friends, enough to make me jealous sometimes, how many times he gets snuggled and smooched. Sal (a name we picked almost instantly after we found her, because we just liked the feel of it) most often goes by Hound...which she undeniably is. Especially in her voice. She yodels. Well, I already told you the story on Loki and Sal. Chase, we found as a puppy in an Anchorage, Alaska pet store. Our old Lab was dying and I wanted to get Sherrie something to distract her; and I'd long been interested in Heelers, AKA Australian cattle dogs, ever since I traveled to Australia years ago and watched them working livestock, jumping on and off of motorcycles or right under horses' hooves. They're 2/3 dingo, and not a dog for beginners, especially the girls. You might as well have a coyote living in your house. Smart, stubborn, and an odd mix of fearlessness and neurosis. Plus incredibly bonded. Once one likes you, you're stuck for life. Brisa we got as a semi-rescue from a top breeder who wanted to get rid of her because she was too shy. One more thing about Sal--not only did we find her starving by the side of the road, when we stopped and opened the door to check her out and see if we could help her, she basically came running over and hopped right into the car like she'd been waiting for us. Hard to say who chose who. Absolutely, they help. Writing is by nature a solitary business; and with the dogs curled up around my desk, the two cattle dogs generally right under my feet, it's impossible to be lonely. They also give me excuses to take breaks--oh, I gotta go throw some frisbees for the dogs, or go for a run with them--any excuse will do. Did your dogs ever meet the wolf who is the focus of your new book, A Wolf Called Romeo? Nose to nose, more than once. Chase, at the time 18 months old and almost psychotically dog-reactive, once charged Romeo, 15 pounds against 120, and got gently pinned and play-mouthed for her troubles. But also, when Romeo started getting a bit too interested in Brisa, brand-new at the time, Chase jumped right in the wolf's face, curled back her lips, and told the wolf to back off...which he did. As for Loki and Sal, they came along after Romeo was long gone. We did have two other dogs then who both met and played with the wolf--Dakotah, the yellow-white Lab on the book cover, and Gus, a retired Seeing Eye black Lab [photo left: with Romeo and Chase]. Matter of fact, my wife Sherrie gave Romeo his name because he seemed so enamored of Dakotah. She murmured one day, 'well, there's that Romeo wolf again,' and the name stuck. Brisa and Loki adore each other. Sal adores every dog she ever met, and can disarm the most aggressive dog with her nonreactive, submissive cheerfulness. Chase, being a cattle dog to the core, doesn't think much of other dogs. She's bonded to me, though she loves Sherrie of course. Even now, mostly blind and deaf and 13 plus years old, she follows me around everywhere I go and is seldom farther away than at my feet--which she is, right now. Brisa is the same way with Sherrie. Chase has always been incredibly courageous--which doesn't mean she's not afraid, but that she overcomes fear. A couple of autumns ago, she charged two black bears that were chasing Loki, right on his tail and incoming toward us, 20 feet away, and they turned tail and ran after she rushed them, jaws popping. Brisa is the same way, especially with Sherrie. She guards her and if anyone tried to hurt her, The Poke Chop would be in their grill straight off. Brisa is also an incredible athlete--even at age nine, she does these gravity-defying leaps to snag frisbees that seem impossibly out of reach. In another life, she'd have been an NFL wide receiver. Sal, well, she's just a sweetheart, an incredible optimist, cheerful in all weather. Loki has this unbelievable drive and acceleration. Dog agility is a very competitive sport, full of wonderful, hard-driving border collies and so on. And Loki still stands out. Once he gets a bit more experienced, the sky's the limit. And at the same time, he's such a soft, sensitive dog. 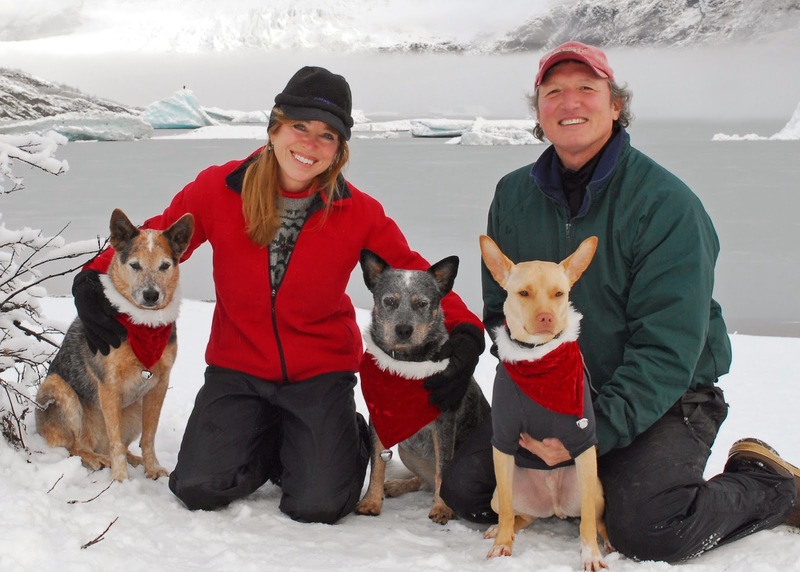 If your dogs could change one thing about Alaskans, what would it be? Well, Alaskans tend to love dogs. Everyone seems to have a few. I think they like Alaskans just fine the way they are. Maybe they'd change the leash laws in Juneau, where we lived 15 years. That's easy. What's it like to be you? Good story. You are a lucky fellow doing what you love, plus 4 beautiful dogs and one beautiful wife. What a way to make me homesick for Alaska, two of my dearest friends, and of course the dogs! What wonderful memories we share and experiences with our dogs that few could imagine. Experiencing Romeo first hand was unforgettable and I can't wait to devour the book! uplifting for the soul. I think all of we who have a dog for a friend are blessed, and you are quadruply so. Thank you.